The McIntosh MCD1100 is more than the most advanced CD/SACD Player. The McIntosh MCD1100 has quad balanced digital to analog conversion, variable audio output for preamplifier functionality, five digital inputs (one USB), and high audio performance balanced level control circuitry. It's a complete value for money deal for all the music lovers and the users who like McIntosh. 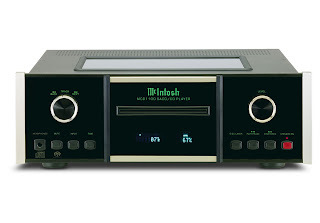 Use it as digital source component or connect directly to a McIntosh amplifier and enjoy a complete digital based McIntosh audio player. Note that USB input is currently limited to 48/16 resolution input. McIntosh will have a software update to take this to 96/24 in the June 2011 timeframe.